Our science PBA is tomorrow. We will be drawing a patch for our space camp rotations and writing about what you have learned in each rotation. We will also take a class photo at the start of class, so look pretty. In just over a week, we’ll be watching our end of the year video in class. To get ready, plan to take a whole group photo with me in class on Thursday before the PBA, and check out the trailer below! Year End Videos from Janelle Wilson on Vimeo. How can I be successful on the science PBA next week? We actually spent class together today due to the short schedule. We discussed the components of the science PBA next Thursday. You will continue your space camp rotations on Monday. Then, you will come to me on Thursday for the PBA. You will finish space camp next Friday. On Monday, May 20, we will review for the benchmark, and we will have block schedule the last two days of school. I can’t believe the end of the year is almost here. It doesn’t seem possible! How can I create and launch a successful bottle rocket? Over the past few days, we have been building rockets made out of soda bottles. Yesterday, 3-5th periods launched their rockets. First period will launch their rockets today. This is part of our Longhorn Space Stampede Rotations. Third – fifth periods will move on to Mr. Carley today and begin an Entry, Descent, and Landing egg drop activity. First period rotates on Monday. Remember, if you are in 3rd-5th periods, I need your lab data from the fabric absorbency lab. Please bring it to me ASAP! Today we had an awesome special guest demo with scientists from Alcon sharing with us about how lenses work, feeling contact lenses, and creating different polymers. I really hope you enjoyed this special event today! Don’t forget to let me know if you want to order a patch for the microgravity flight that you helped complete the experiment for! Also, 3-5 periods, the lab right up for extra credit is due on Friday. If you choose not to do the extra credit, please turn in your data table ASAP. Are you interested in purchasing a woven microgravity flight patch for $2-3? 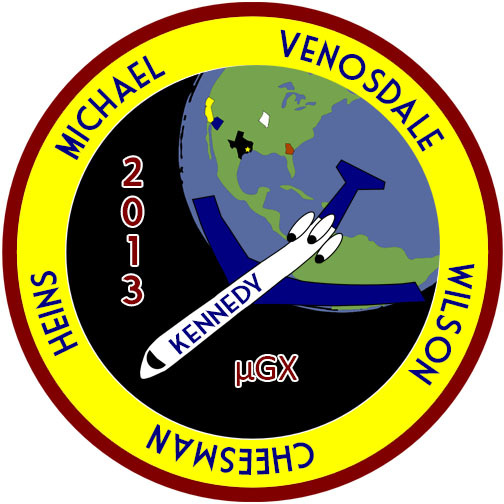 We are getting ready to have the patches for the microgravity flight this summer made. Since students helped with the experiment, I wanted to offer you the chance to purchase the patch. It will cost between $2-3. The patch will probably look like the image below. Please complete the poll so I know how many patches to order. Thanks! We started working on the ground based experiment for the microgravity flight. Clean ups in space video. Wringing out water in space video. Wrote question, hypothesis, materials, and procedures for experiment. I will be checking your CRCT review packet on Thursday. Make sure you have it finished. Don’t forget to email me if you are interested in being the photographer or videographer/interviewer for your class instead of doing the experiment. I need two people. If you want to be the videographer/interviewer, you must feel comfortable interviewing students in our class. We continued to work on our CRCT review folder today. We will wrap this up on Wednesday. First period was short today due to CRCT schedule changes. I will be checking your CRCT review packet on Wednesday. Make sure you have it finished. As you are working on your CRCT review packets, the photos from an old CRCT review folder I have may help. You can see most of it embedded below, or you can click on the link to see the entire thing. Remember, CRCT review packets are due tomorrow for 3rd period, Tuesday for 4th and 5th periods, and Wednesday for 1st period.